I was born William (Bill) Dale Wall in Raymond, Washington on May 11, 1951. My parents were William Raymond Wall and Bobbie (Brown) Wall, both chess players. I probably learned chess from my parents when I was around 10 years old in San Francisco. From 1967 to 1969 I played board 2 and board 1on the high school chess team at Clover Park High School and Lakes High School in Tacoma, Washington. In the summer of 1969, after graduating from High School, I joined the Tacoma Chess Club in downtown, Tacoma Washington. In September, 1969 I attended Northrop Institute of Technology in Inglewood, California and quickly took up chess there. I was President of the college chess team. I entered the 5th American Open on Thanksgiving Day, November 27, 1969 at the Retail Clerk's Union Auditorium on 1410 2nd Street in Santa Monica. Entry fee was $15 for me and I joined the United States Chess Federation (USCF) for $5. It was an 8 round Swiss System event. The tournament director was William Bragg. Top player was 20-year old International Master (and later Grandmaster) Walter Browne (2445). The mayor of Santa Monica welcomed the players. He played on board 1. Time control was 50 moves in 2 hours. The event was won by Ray Martin. Other players there included Kim Commons, Larry Christiansen, Tibor Weinberger, Jude Acers, Charles Henin (California State Champion), Ross Stoutenborough, Ron Gross, and Carl Pilnick. Walter Browne got knocked off by John Davidian who sacrificed his rook to get a mating position with Queen and Bishop in 29 moves. The youngest player was a 7-year old. The player on the last board was me. I played on board 101 of the 202 player event. I was only able to complete 4 games and ended up with a provisional rating of 1522. In 1970 I returned to Tacoma, Washington and continued to play chess at the Tacoma Chess Club. In February, I went to North Augusta, South Carolina and formed a chess club there. I played chess in Augusta, Georgia and met several chess players in the area (Dodgen, Garris, Lee Hyder, etc). In September, 1970 I joined the U.S. Air Force. While in Basic Training at Lackland AFB in San Antonio, Texas, I won the base championship. After Basic Training, I was assigned to Aircraft Maintenance School at Sheppard AFB in Wichita Falls, Texas. I won that base championship in December, 1970. In 1971, I was assigned to Beale AFB in Marysville/Yuba City, California. I was a crew chief on KC-135Q tankers that refueled SR-71 Blackbirds. I organized a chess club and wrote a chess column for the base paper. The other top two players there were Dr (LtCol) Henry Giertych (USCF expert) and Capt John Manson (Class A player) . In December, 1971 I was assigned to Kadena Air Base, Okinawa and played a lot of chess at the Naha USO chess club where I met players like Kalish, Swaim, Pendergast, Bob Karch, etc. I was TDY to U Tapao Air Base, Thailand and won its USO chess championship. In February, 1973 I played in the Central California Grand Prix in Berkeley, directed by Martin Morrison. I took 2nd place in the under-1800 section. On June 30 to July 4, 1973 I played in the first World Open in New York, held at the McAlpin hotel at 34th and Broadway, directed by Bill Goichberg. It was a 10 round Swiss System event. Entry fee was $30. Walter Browne won the event (9-1). The prize fund was $15,000, a world record for an open. There were 725 players, which was a new attendance record. I won 5, lost 3. Returning to Beale AFB, I became a certified tournament director with the USCF and directed a few rated events. I was then given a PCS assignment to U Tapao Air Base, Thailand where I won all the weekly USO chess tournaments. In 1974 I was temporally assigned to Anderson Air Base, Guam for 5 months. I organized and directed several chess tournaments on the island. On return to U Tapao, I was inducted into the Thailand USO Hall of Fame for my chess activities. I was honorably discharged in September, 1974 as a Staff Sergeant and returned stateside. I went to Statesville/Taylorsville, North Carolina and started up a chess club. I was the chess coach and trainer for the local high school (Alexander Central HS), which won the North Carolina State High School Chess Championships three years in a row. In May 1975, I played in the World Class Championship in Vancouver, British Columbia and took 5th place. I met and interviewed Paul Keres and Walter Browne at that event, and ran their wall boards during the tournament. In December 1975, I played Walter Browne in a simultaneous exhibition in Henderson, NC and lost in 40 moves. The next day I beat him, 6-0, but that was in tennis. 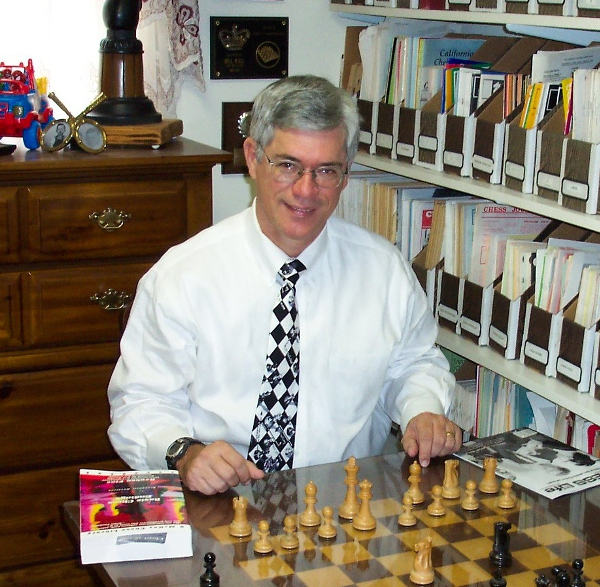 During 1975 I wrote a chess column (Pawn Power) for the Statesville newspaper and was Vice Chairman of the Southern Chess Administration, run by Dr. Alan Lipkin. I also directed the Lawrence Pfefferkorn Open (LPO) in Winston-Salem. In 1976 I was President of the Wilkes College and Mitchell College chess clubs and played board 1. I won the Wilkes County chess championship in February. In September, I was elected Secretary-Treasurer of the North Carolina Chess Association. From 1977 to 1983 I was a delegate to the USCF, representing North Carolina and Ohio. I played in the U.S. Open in Columbus, Ohio and attended all the delegates meetings. In 1978-79, I organized and was President of the Lenoir Rhyne College chess club in Hickory, North Carolina. I graduated with a B.S. degree in Physics and won the college championship. In September 1978, I was elected President of the North Carolina Chess Association (NCCA). In April 1979 I played Victor Korchnoi in a 50-board simul in Charlotte, NC and lost in 40 moves. In August 1979, I graduated from Air Force Officer Training School in San Antonio, Texas and became a 2nd Lieutenant. I was then sent to Wright-Patterson AFB in Dayton, Ohio to attend the Air Force Institute of Technology for an electrical engineering degree. Charles Meidinger and I were the strongest chess players on base. In September 1979, I joined the Dayton, Ohio Chess Club in October and organized events for the club. In February 1980, I played Larry Christiansen in a blindfold simul and lost. In March 1980, I was the editor of the Dayton Chess Club Review and was the Vice President of the Dayton Chess Club. In September 1980 I was elected President of the Ohio Chess Association. For a few days I was President of both the North Carolina Chess Association and the Ohio Chess Association at the same time, a first. In 1981 I graduated with a B.S. in electrical engineering and worked as an Avionics engineer in the Air Force labs designing next generation cockpits. In September 1981, I was Secretary-Treasurer of the Ohio Chess Association. In December 1981, I was President of the Dayton Chess Club, with over 150 members. I was its president until 1985. In April 1982, I was co-editor of the Ohio Chess Bulletin. I wrote my first chess book, 300 King's Gambit Miniatures published by Bob Dudley and Chess Enterprises. In 1982, I was nominated USCF volunteer of the year. In 1983 I wrote 500 Sicilian Miniatures. I directed tournaments in Dayton and Xenia, Ohio. In 1984 I wrote 500 French Miniatures. In 1985 I was Secretary of the Chess Journalists of America. I also wrote 500 Queen's Gambit Miniatures. In 1985, I was assigned to NASA Ames Research Center in Mountain View, CA as a systems and security engineer. I won the Moffett Field NAS chess championship several times and played in several Air Force chess championships. From 1986 to 1991, I was the President of the Palo Alto Chess Club in Palo Alto, California with about 200 members. In 1986, I wrote Larsen's Opening, Owen's Defense, 500 Ruy Lopez Miniatures and 500 King's Gambit Miniatures. In 1987 I wrote 500 Italian Miniatures and 500 Sicilian Miniatures II. In 1988 I wrote Grob's Attack and 500 Queen's Gambit Miniatures II. In January 1989, I was a chess journalist for the Karpov-Hjartarson World Quarterfinals Chess Championship in Seattle. In February 1989, I drew Eduard Gufeld in a 25-board simul in Palo Alto. In April 1989, I lost to Eugene Torre in a 20-board simul in Palo Alto. In June 1989, I beat International Master John Donaldson in a 20-board simul in Palo Alto. I wrote The Orangutan. In 1990 I wrote 500 Indian Miniatures and 500 English Miniatures. In October 1990, I was a chess journalist for the Karpov-Kasparov World Chess Championship in New York. In 1991 I wrote The 1990 World Chess Championship and 500 Caro Kann Miniatures. I was coach and trainer for Jordy Mont-Reynaud and the Bhat brothers at the Palo Alto Chess Club. Jordy and Vinay Bhat became America's youngest masters. I ran the demo boards for Tal, Browne, and others at the San Francisco International. In 1991, I was assigned to the Air Force Information Warfare Center at Kelly AFB in San Antonio, Texas. In 1992, I wrote Smith-Morra Gambit Accepted with the help of Ken Smith. I ran for President of the Texas Chess Association and took 2nd place in votes. In 1993, I wrote Smith-Morra Gambit Declined and 500 Pirc Miniatures. In 1995, I wrote Dunst Opening and 500 French Miniatures II. I was Vice President of the International Email Chess Club (IECC). In 1995, I retired as an Air Force Major after 25 years of service, turning down promotion to Lt. Col and a Pentagon assignment. From 1995 to 2000, I was the sysop for Microsoft's Internet Gaming Zone (zone.com) and directed the first worldwide Internet chess tournament. In 1997, I wrote 500 Scotch Miniatures. I participated in a Paragon cable TV show on scholastic chess. In December 1997, I went to work for Harris Corporation in Melbourne, Florida as in Information Systems Security Engineer. I created a network vulnerability scanning tool called STAT and worked on dozens of projects that need Information Assurance and computer security hardening. In 1998, I wrote 700 Opening Traps. I was director of the Melbourne, Florida Chess Club. In 1999, I wrote 500 Blackmar Diemer Gambit Miniatures. I participated in a weekly cyber-radio show on chess. In 2000, I contributed to several web sites on chess trivia, chess games, and humor. In 2001, I wrote 500 Center Counter Miniatures and Off The Wall Chess Trivia for ChessCentral. In 2003, I sponsored the Bobby Fischer display at the World Chess Hall of Fame in Miami and was a charter member of the Hall of Fame. In 2004 I was chess instructor at Palm Bay, Florida schools. I was a contributor to Black & White, a chess magazine in India, for several years. In 2005 I was a contributor to www.chessgames.com and wrote 60 chess e-books (DB books) for Gambit Chess. On May 18, 2007, I became the first member, excluding staff, of chess.com. In 2008, I wrote Winning with the Krazy Kat and Old Hippo, with Gary Gifford and Davide Rozzoni, published by Lulu Publishing. As of January 2015, I have written 35 chess books and over 1,100 chess articles.